The Lenovo ThinkSystem SR670 is a 2U rack server that has been designed to support up to four high-performance GPUs. This system is ideal for running AI, HPC, and VDI workloads. This product guide provides essential pre-sales information to understand the ThinkSystem SR670 server, its key features and specifications, components and options, and configuration guidelines. This guide is intended for technical specialists, sales specialists, sales engineers, IT architects, and other IT professionals who want to learn more about the SR670 and consider its use in IT solutions. Not available in LA: The SR670 is not available in countries in the Latin America geographical area. The Lenovo ThinkSystem SR670 is a 2U rack server that has been designed to support up to four high-performance GPUs. Models of the SR670 are powered by two Intel Xeon Processor Scalable Family processors and the ratio of 1:2 for CPUs to GPUs means the server is an excellent choice for the emerging requirements for HPC and AI. Suggested uses: The SR670 system is ideal for running Artificial Intelligence (AI), High Performance Computing (HPC), and Virtual Desktop Infrastructure (VDI) workloads. Four GPUs per server is the sweet spot in price-performance and the architecture of the SR670 is ideal for scale-out with both HPC and AI workloads. The server adheres to open industry standards, provides modularity for users, and avoids single points of failure. Lenovo is the leading provider of supercomputers in the TOP500. Lenovo is trusted by 17 of the world's top 25 research universities to provide scalable, high-performance solutions. The SR670 provides the latest in performance and reliability with a scalable solution for enterprise and research. The Lenovo ThinkSystem SR670 delivers optimal performance for Artificial Intelligence (AI) and high-performance computing (HPC) workloads while maintaining a low total cost of ownership (TCO). The SR670 allows up to four GPUs per 2U node and is suited for computationally intensive workload requirements for both Machine Learning (ML) and Deep Learning (DL). Built on the latest Intel Xeon processor Scalable Family CPUs and designed to support high-end GPUs including NVIDIA Tesla V100, the ThinkSystem SR670 delivers optimized performance for AI training and accelerated HPC workloads. Supports Gold level processors in the Intel Xeon Processor Scalable Family. Processors supported have up to 16 cores, core speeds of up to 2.6GHz, L3 cache sizes up to 22 MB, and TDP ratings of up to 150W. Additional processor support, up to 205W TDP, is available via special bid. Two processors, 32 cores, and 64 threads maximize the concurrent execution of multithreaded applications. Supports up to four high-performance GPUs, including the NVIDIA Tesla V100, resulting in a 1:2 ratio of CPUs to GPUs. This is an ideal mix of processing power for emerging sciences. Support for up to 24 TruDDR4 memory DIMMs operating at 2666 MHz means you have the fastest available memory subsystem and memory capacity of up to 768 GB using 24x 32 GB RDIMMs. High-speed RAID controllers from Broadcom provide 12 Gb SAS connectivity to the drive backplane. 12 Gbps SAS internal storage connectivity doubles the data transfer rate compared to 6 Gb SAS solutions to maximize performance of storage I/O-intensive applications. Up to 8x 2.5-inch drives, supporting HDDs and SSDs, either SAS or SATA, provide a flexible local storage platform. A total of 7 PCIe slots: 4 full-height full-length and double-width PCIe 3.0 x16 slots for GPUs plus three additional general-purpose PCIe 3.0 slots for network adapters. The server has up to two hot-swap redundant power supplies and six simple-swap redundant fans to provide availability for business-critical applications. Proactive Platform Alerts (including PFA and SMART alerts): Processors, voltage regulators, memory, internal storage (HDDs, SSDs, M.2 drives), fans, power supplies, server ambient and subcomponent temperatures. Alerts can be surfaced through the XClarity Controller to upstream managers. These proactive alerts let you take appropriate actions in advance of possible failure, thereby increasing server uptime and application availability. Three-year or one-year customer-replaceable unit and onsite limited warranty, 9 x 5 next business day. Optional service upgrades are available. The SR670 can also be ordered without a warranty if needed. Supports Lenovo intelligent Computing Orchestration (LiCO), a powerful platform that manages cluster resources for HPC and AI applications. LiCO supports multiple AI frameworks, including TensorFlow, Caffe, Neon, and MXNet, allowing you to leverage a single cluster for diverse workload requirements. The following figure shows the architectural block diagram of the SR670, showing the major components and their connections. Processor Up to two Intel Xeon Processor Scalable Family of processors. The SR670 supports Gold level processors (formerly codename "Skylake") up to 16 cores and TDP ratings up to 150W. Additional processor support up to TDP 205W is available via Special Bid. Two Intel Ultra Path Interconnect (UPI) links at 10.4 GT/s each. Memory 24 DIMM sockets (12 DIMMs per processor) supporting Lenovo TruDDR4 DIMMs at up to 2666 MHz. RDIMMs are supported. LRDIMMs and 3DS RDIMMs are currently not supported. Memory maximums With RDIMMs: Up to 768 GB with 24x 32 GB RDIMMs and two processors. Disk drive bays Eight 2.5-inch hot-swap drive bays supporting SATA HDDs and SSDs. M.2 slot for one or two M.2 drives. Maximum internal storage Up to 16 TB using 8x 2TB SATA HDDs, or up to 12.8 TB using 8x 1.6 TB SAS SSDs. Mix of SSDs/HDDs supported. Network interfaces None standard; add networking via a PCIe adapter. Dedicated Ethernet port for systems management (connected to the XClarity Controller) is standard. Front: One USB 2.0 port, one USB 3.0 port, one VGA video port, one RJ45 XClarity Controller (XCC) systems management port. Rear: One DB9 serial port. The serial port can be redirected and accessed remotely via IPMI or SSH via XCC. Cooling Six N+1 redundant simple-swap 60 mm dual-rotor fans (all six standard). One fan integrated in each power supply. Power supply Two 2000W hot-swap AC power supplies with 80 PLUS Platinum certification. Power supplies are redundant in most configurations. Requires 200-240 V AC power (110 V AC not supported). Video G200e graphics with 16 MB memory with 2D hardware accelerator, integrated into the XClarity Controller. Maximum resolution is 1920x1200 32bpp at 60Hz. Systems management XClarity Controller embedded systems management. 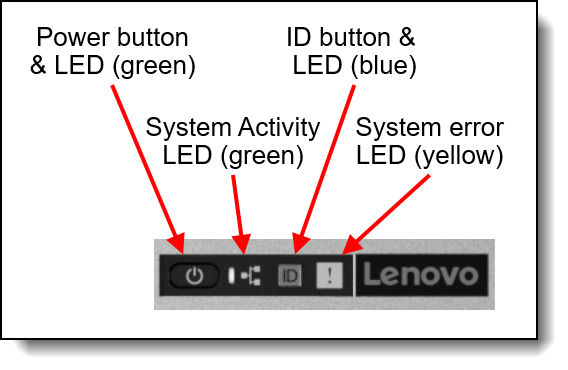 Support for Lenovo intelligent Computing Orchestration (LiCO), Lenovo XClarity Essentials (BoMC, UpdateExpress, OneCLI), Lenovo XClarity Provisioning Manager. Redfish API Spec v1.0.2 compliant. Optional XClarity Controller Advanced or Enterprise with software license upgrade to enable remote control functions. XClarity Administrator and XClarity Energy Manager currently not supported. Security features Power-on password, administrator's password, Trusted Platform Module (TPM), supporting TPM 2.0 . In China only, optional Nationz TPM 2.0 plug-in module. Operating systems supported Red Hat Enterprise Linux. See the Operating system support section for specifics. Limited warranty Three-year or one-year or no warranty (model dependent). Customer-replaceable unit (CRU) and onsite limited warranty with 9x5 next business day (NBD). 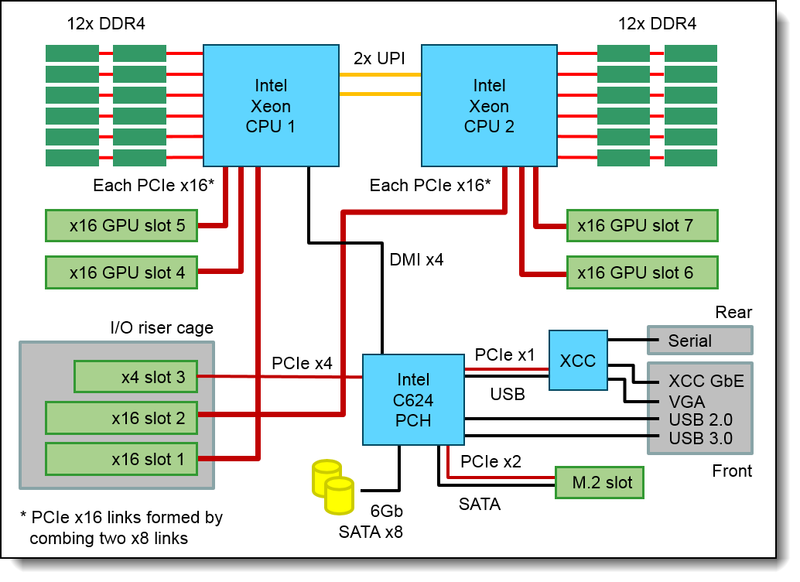 The SR670 supports two processors in the Intel Xeon Processor Scalable Family. Both processors must be installed. The server supports the processor options that are listed in the following table. Special bid support: Additional processor support, up to 205W TDP, is available via special bid. The SR670 server supports TruDDR4 memory. TruDDR4 memory uses the highest-quality components sourced from Tier 1 DRAM suppliers and only memory that meets strict tolerances is selected. It is compatibility tested and tuned to maximize performance and reliability. The SR670 supports up to 12 DIMMs per processor, for a total of 24 DIMMs when two processors are installed. Each processor has six memory channels, and supports one or two DIMMs per channel. The following table lists the memory options that are available for the SR670 server. The server supports RDIMMs. LRDIMMs, 3DS RDIMMs and UDIMMs are not supported. 12 DIMMs, which are installed in DIMM slots 1, 3, 5, 8, 10, 12, 13, 15, 17, 20, 22, and 24. 24 DIMMs, installed in all slots. All DIMMs to be installed must be the same type and capacity. If memory rank sparing is used, then a minimum of one quad-rank DIMM, one dual-rank DIMM, or two single-rank DIMMs must be installed per populated channel (the DIMMs do not need to be identical). In rank sparing mode, one rank of a DIMM in each populated channel is reserved as spare memory. The largest rank in the channel will be automatically selected as the spare rank. The amount of memory available to the operating system depends on the number, capacity and rank counts of the DIMMs installed. The server support 8x 2.5-inch drives. Currently, only SATA HDDs and SSDs are supported. You can mix drives in the same server, but not in the same array. Drives are all installed from the rear of the server. The server also supports one or two M.2 drives, installed in an M.2 adapter. The SR670 offers eight 2.5-inch hot-swap drive bays, located at the rear of the server. All eight drive bays are connected to a single backplane. The backplane supports SAS and SATA drives. SAS drives require the use of a supported SAS HBA or RAID controller. The drive bays are numbered as shown in the following figure. The drive bays support 6Gb SATA drives or 12Gb SAS drives. NVMe drives are not supported. The following table lists the supported adapters. The onboard SATA controller onboard is integrated into the server chipset. An SFF-9402 OCulink x8 SATA connector routes the signals to the eight internal drive bays at the rear of the server. The SATA controller operates in either AHCI mode for JBOD support, or Intel RSTe mode for RAID support. In RSTe mode, Intel RAID features are accessible via XClarify Provisioning Manager (UEFI-based) where you can enabling RAID volumes of up to 8 drives. RAID levels 0, 1, 5, 10 are supported. Virtualization support: The SATA ports of the onboard SATA controller can be used with virtualization hypervisors, including VMware ESXi, Linux KVM, Xen, and Microsoft Hyper-V Server, however support is limited to AHCI (non-RAID) mode. RSTe mode is not supported with virtualization hypervisors. The following table compares the functions of the storage adapters and the onboard SATA controller. The server does not supports any internal backup units, such as tape drives or RDX drives. The server does not supports an internal optical drive. 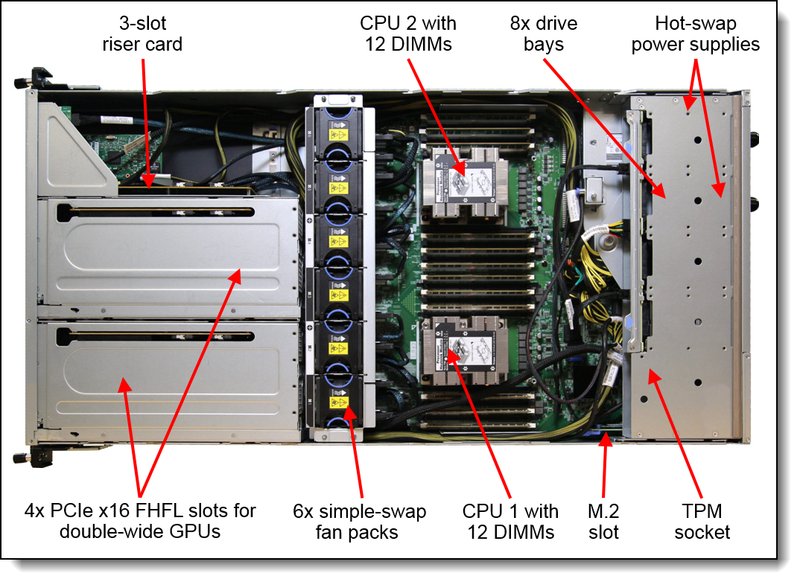 The server supports up to 7 front-accessible PCIe slots. All slots are standard. The following figure shows the location of the PCIe slots. The SR670 does not have an onboard Ethernet controller. The following table lists supported network adapters that can be installed in the regular PCIe slots. The SR670 does not currently support any Fibre Channel adapters. The following table lists the SAS HBA supported by the SR670 server for use with external storage. The following table lists the specifications of the supported external SAS HBA. * SAS HBAs support SEDs (self-encrypting drives) by using software on the server and simply passing SED commands through the HBA to the drives. The SR670 does not currently support any Flash Storage adapters. The SR670 supports the GPUs listed in the following table. For customers that purchase the AMD Radeon Instinct MI25 directly from AMD, the required power cable is not included with the GPU. To use a customer-supplied MI25 GPU with the SR670, order the cable listed in the following table, one for each GPU to be installed. Note: This cable is only for a customer-supplied AMD Radeon Instinct MI25. Option part number 4C57A16224 already includes the cable. The cable is not required for any NVIDIA adapter. The server has six 60 mm simple-swap fans and all six fans are standard in all models. The server offers N+1 fan redundancy, meaning that one fan can fail and the server still operates normally In typical datacenter environments. However, if the ambient temperate is above 27°C and a fan failure occurs, the GPUs may be instructed by the system to enter an emergency power reduction state whereby GPU performance will be impacted. Each power supply has an integrated fan. The server includes two 2000W hot-swap redundant power supplies. Both power supplies are standard. In such configurations, in the event of a single power supply failure, the server will throttle the performance of the GPUs. The server supports booting from an operating system or hypiervisor installed on an M.2 solid-state drive. See the M.2 drives section for details and the list of available options. The SR670 contains an integrated service processor, XClarity Controller (XCC), which provides advanced control, monitoring, and alerting functions. The XCC is based on the Pilot4 XE401 baseboard management controller (BMC) using a dual-core ARM Cortex A9 service processor. The SR670 offers a front operator panel with key LED status indicators, as shown in the following figure. Note: The System Activity LED is not currently being used. The following table shows the field upgrades available for SR670 servers already deployed. The Nationz TPM module is available only for China customers and is installed in a dedicated socket on the system board, as shown in Figure 4. * Not available as a field upgrade. The component is configure to order only. The SR670 supports a slide rail kit, however a cable management arm is not available. The following table lists ordering information. * Only available as part of a configure-to-order (CTO) configuration. Not currently available as a separate option. 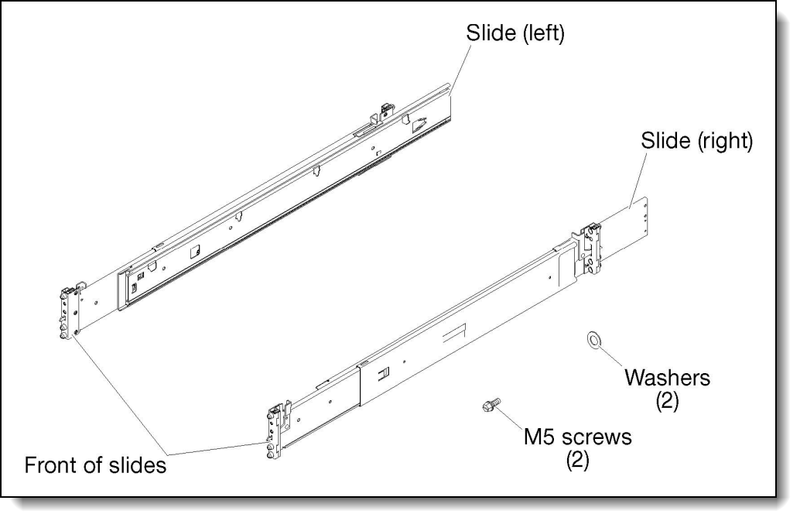 The following figure shows the Slide Rail kit. When GPUs are installed, the ThinkSystem SR670 server complies with ASHRAE Class A2 specifications. These sound levels were measured in controlled acoustical environments according to procedures specified by ISO7779 and are reported in accordance with ISO 9296. The declared acoustic noise levels are based on specified configurations, which may change slightly depending on configuration/conditions. Government regulations (such as those prescribed by OSHA or European Community Directives) may govern noise level exposure in the workplace and may apply to you and your server installation. The actual sound pressure levels in your installation depend upon a variety of factors, including the number of racks in the installation, the size, materials, and configuration of the room, the noise levels from other equipment, the room ambient temperature, and employees' location in relation to the equipment. Further, compliance with such government regulations also depends upon a variety of additional factors, including the duration of employees' exposure and whether employees wear hearing protection. Lenovo recommends that you consult with qualified experts in this field to determine whether you are in compliance with the applicable regulations. The SR670 has a 1-year or 3-year warranty based on the machine type of the system. It is also available without any warranty. The PCIe slots in the SR670 are all front-accessible. This means that top-of-rack networking switches would normally be installed at the front of the rack and all switches would have front-to-rear airflow (Opposite Port Side Exhaust or oPSE). The server supports the top-of-rack Ethernet switches that are listed in the following table. If desired, switches with traditional air flow (rear to front) can also be used, with such switches installed at the rear of the rack and cables routed to the front of the rack to connect to the network ports of the SR670 server. ActiveX®, Hyper-V®, and Microsoft® are trademarks of Microsoft Corporation in the United States, other countries, or both.